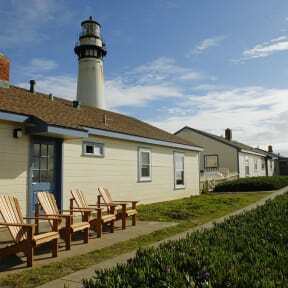 HI Pigeon Point Lighthouse Hostel i Pescadero, USA: Reservér nu! Tide pools, redwoods, elephant seals, gray whales, hiking, biking, and the famous cliff-side hot tub await you at HI-Pigeon Point Lighthouse! Perched atop a cliff on the site of a 115-foot-tall, working lighthouse, HI-Pigeon Point is one of the top-customer-rated HI hostels in the world. Just 50 miles from San Francisco, come explore neighboring Pescadero Marsh, Ano Nuevo State Reserve, Big Basin Redwoods State Park, and a string of state beaches. At night, fall asleep on Tempur-Pedic mattresses as you listen to the sound of waves crashing below. Hostel amenities include free Wi-Fi, free linens, towels for rent, bag and bike storage, three fully equipped guest kitchens, beach access, an outdoor fire pit and patio, and a hot tub overlooking the ocean ($8 per person per half hour). 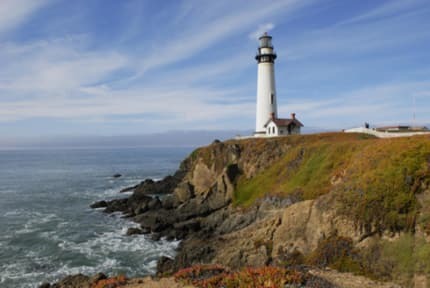 If you ever tire of the hostel’s beach-cottage atmosphere and all the outdoor fun nearby, take a break in the small town of Pescadero or head 30 miles south for a day in Santa Cruz. The hostel is a Certified Bay Area Green Business. Our green practices include composting; recycling; reducing water and energy usage through efficient appliances, lighting, and faucets; and using environmentally friendly cleaning products.